I'm not going to do anything with the PLC program, I just need some data in a number of tags. Next, we're going to set up a DDE/OPC Topic in RSLinx. Depending on the version of RSLinx you use, it might look slightly different, but you should be able to follw this with the screenshots. As you can see, I have a 10 slot CLX rack, with a 1756-ENBT card in slot 1 (address 134.200.211.16), and two processors, one in slot 0, and one in slot 2. The one in slot 2 is the processor we are going to use for this exercise. Now, open up the DDE/OPC topic configuration by clicking 'DDE/OPC' and then 'Topic Configuration' in the top menu of RSLinx. To test if your setup is working, at this point you can use the OPC test client provided with RSLinx. I'm not going into detail about that, but I did make sure this worked before continuing with the next step, creating the Excel sheet. 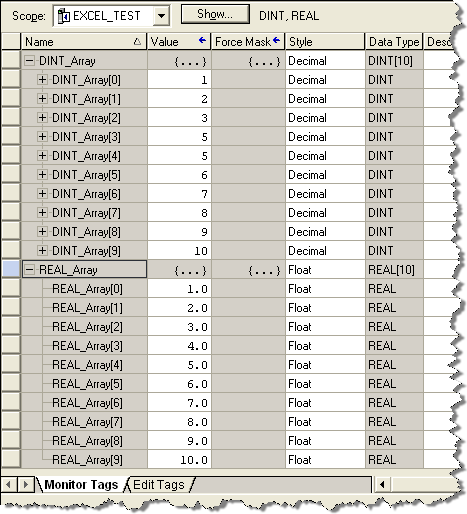 The variable 'rslinx' will hold the number of the open channel.Â All subsequent DDE functions use this number to specify the channel. 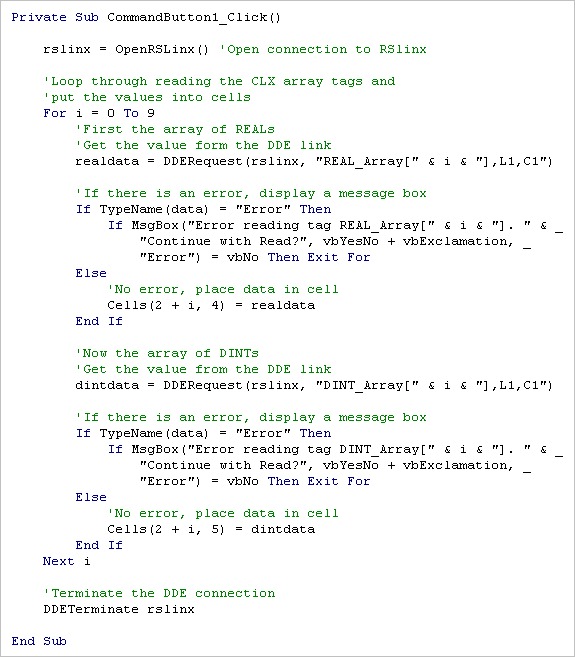 To save you all the steps to program the rest of the code, here is the final code to get the array of REALs out of the controller, and put them in cells D2 â€“ D11, and the array of DINTs in cells E2-E11. Now we know how to read, it would of course be a lot of fun if we could write values as well. I would like to be able to change the values in the cells, and then hit a 'Write Data' button. The way this is implemented is of course very rudimentary, but once you get the concept, the sky is the limit. To make this easier on everybody, I've included the Excel file with the code already in it. 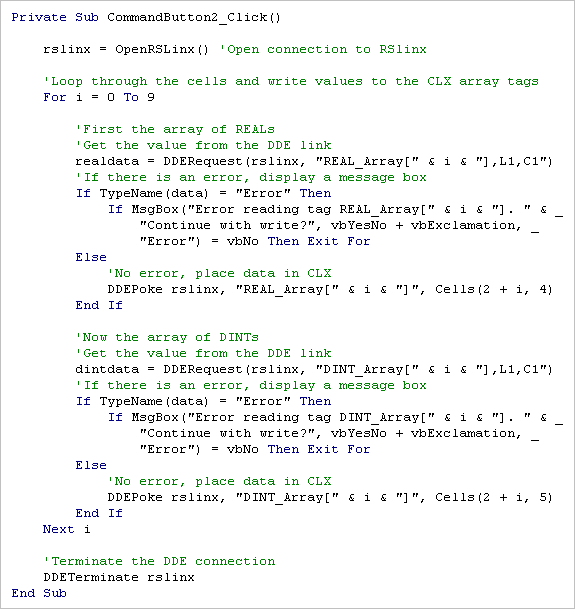 The only thing you have to do to make this Excel sheet work, is make sure there is an DDE/OPC topic in your RSLinx setup called 'EXCEL_TEST', and the arrays REAL_Array and DINT_Array in your controller (of at least length 10). Submitted by Tim Young on Wed, 2009-07-01 13:51. It's worth noting that if your topic is set up then you can also make a hard reference in a cell with the following format. You'll get the number in the cell if successful otherwise it will say #REF! if there is a problem. This is great as a quick test or if you just need a simple value. Submitted by Anonymous (not verified) on Thu, 2010-02-04 12:11.
alright I get a number but then the actual value doesn't show in the cell... What do I do next? Submitted by Anonymous (not verified) on Sun, 2009-09-06 11:21. The downside to this method is very slow data transfer rates. I beleive most of this is due to Excel, becuase when using Visual Basic with RSLinx Topic the transfer rates are much faster. There are also problems related to RSLinx Topic configuration. If there are many Topics created or some with similar names the Excel program can have troubles connecting. I have had to delete Topics in RSLinx when this happens. Submitted by Vu (not verified) on Wed, 2010-04-07 22:25. Submitted by Ryan Quigley (not verified) on Fri, 2010-06-04 14:43. Otherwise the code won't ever alert the user to an error. Submitted by Tim Young on Fri, 2010-06-18 21:49. Submitted by mike4bizz on Wed, 2012-12-05 06:38. I am kind of confuse on why you concatenated "i" and not just use it as is. Can you please explain why that is? Submitted by Tim Young on Sun, 2012-12-09 22:30.
i is a variable determined by the for next loop. So you concatenate because you want the message to show the actual number and not the letter i. Submitted by Gil Flores (not verified) on Wed, 2010-06-30 14:21. 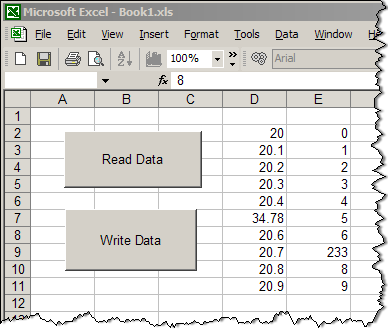 Hi, I read this grat tutorial, I am developing a project in which I must transfer 6 data from a excel sheet, when selecting an option in the PanelView 1000+, to a Micrologix 1500. 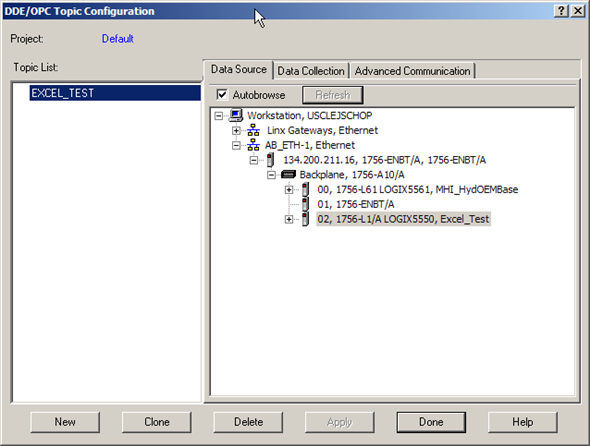 I have seen example and already I have realised some test, but only of shipment the data from Micrologix to excel. I'm been doing through RSLinx. 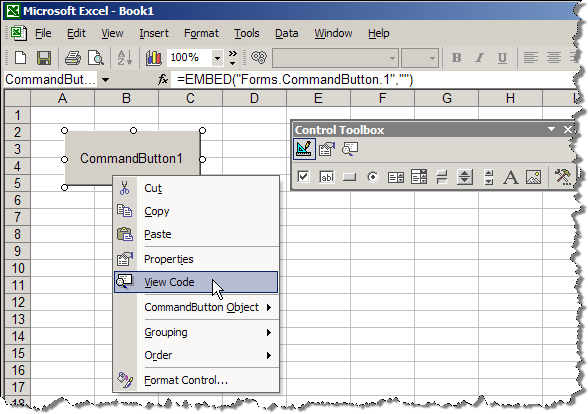 Do you know how I cand send data from excel to plc? Thanks in advance. Submitted by Larry (not verified) on Wed, 2010-07-07 03:02. Below is a small macro that could be expanded for larger projects. In excel, column D should contain the exact PLC tagname that you wish to write to, and column F should contain the value that you wish to write into the PLC tag. Works well for me and so simple. Oh, you also need to setup a topic called "EXCEL" in RSLINX that connects to the PLC you wish to write to. Submitted by Anonymous (not verified) on Tue, 2011-02-15 09:26. I have a problem with the excel sheet. When I try to write real number like 4.5, 6.7 , 8.9 the controllogix do not receive the correct number. When I try to write real number like 4.0, 6.0, 8.0 there is no problem. Has anyone seen the same problem or found the solution? Submitted by Anonymous (not verified) on Wed, 2011-12-14 13:45. Submitted by Anonymous (not verified) on Tue, 2011-06-21 08:13. Submitted by Coowallsky (not verified) on Fri, 2011-12-16 11:38. Why not simply use the Tag Upload/Download Utility that comes with RSLogix5000 software? Submitted by Jay Harbath (not verified) on Thu, 2012-03-08 21:56. The Rockwell tag utility might be too limited for someone's needs. As an example, their PLC compare utility is pretty useless. I wrote my own that is much more user friendly. The software here gives you the basic tools to build whatever utility you might need. I've used offshoots of this to read current tags, compare them to the "Gold Standard" and flag when things have changed. The usefulness of this capability is limited by your imagination and the read/write data rate. Submitted by MR Roboto (not verified) on Wed, 2012-05-23 08:27. Thanks for the HowTo. Got it working. What do I have to do to read out a 2Dimensional Array? Submitted by Anonymous (not verified) on Tue, 2012-11-13 21:55. Submitted by R_Wispy on Tue, 2013-09-24 09:31. I also need to read a two dimensional array, but my array is 8 x 96. Rather than 768 individual reads from the PLC using that for-next looping, is there a way to do a single block read of all 768, or even 8 block reads of 96? I can't imagine how slow the excel sheet would update if each array variable were a single read.